The character mesh is divided into selectable controller chunks for different areas which control the deformation of the face. To help aid the animator I created a GUI which can be used to select the parts of the face and shows the animator what can be selected. There are also shortcut buttons to bring up animation tools such the graph editor, dope sheet and the playblast window. All of this aids in creating a clean workspace that is just animator and character. Nurbs curve controls are still available if the animator wishes to use them. It was important that the animator never feel restricted to using just the mesh controls. They can use the selectable mesh, curve controls or both and switch at any time. Mammoth rig with Maya Muscle. A mammoth rig complete with Maya Muscle setup and a blend of dynamic/ FK trunk and tail controls. They can either be animated by hand with FK or through Mayas dynamic hair system or a blend of both. Modeling and animation by me. All the controls can be translated, rotated and in some cases scaled to allow for the maximum number of possibilities and expressions. A joint based face is easily manipulated with clear controls that provide the user with instant and predictable results. Joints can be keyed to create clean and appealing arcs. The head can be rotated as in an FK setup but can also be translated like in IK. The neck is based on a stretchable ribbon setup and can be translated in every direction. The head can also be keyed to follow a head aim control. The head can be squashed, stretched, twisted and bent in every direction for cartoon and extreme movement. The spine is based on a stretchable ribbon setup. It can be rotated as in an FK setup but also translated into any position as in an IK setup. It can also be squashed and stretched into extreme cartoon poses. The spine only has four controls to allow for the most movement with the fewest keys possible. The shoulder control drives the clavicle and automated scapula joint in the back. The three move in unison to create the best possible representation of an anatomically correct shoulder and provide the cleanest deformations possible. The arms can be controlled in both FK and IK. Both can be squashed and stretched for quick cartoon movement. 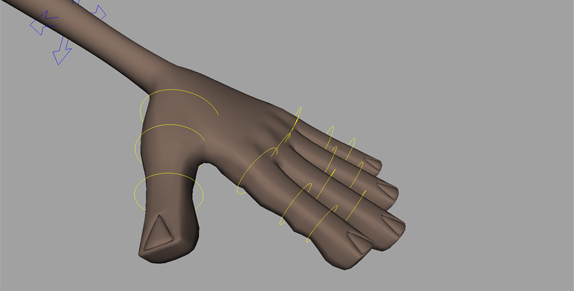 Separate finger controls were used rather than attribute sliders for ease of use and the number of possible positions. 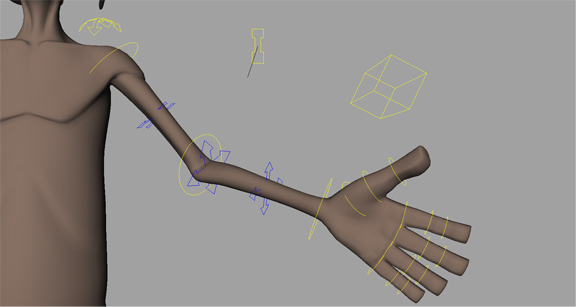 The arms contain extra deformation controls that can be used to create pleasing arcs and bends in the arms. The elbow can be placed in any position that simple FK or IK controls may not be able to achieve. The deformation controls work in both FK and IK. The legs can be controlled in both FK and IK. Both can be squashed and stretched for quick cartoon movement. The IK feet have peel heel, toe tap and toe pivot attributes. The legs contain extra deformation controls that can be used to create pleasing arcs and bends in the legs. The knee can be placed in any position that simple FK or IK controls may not be able to achieve. The deformation controls work in both FK and IK. resting on the head or hips for example. 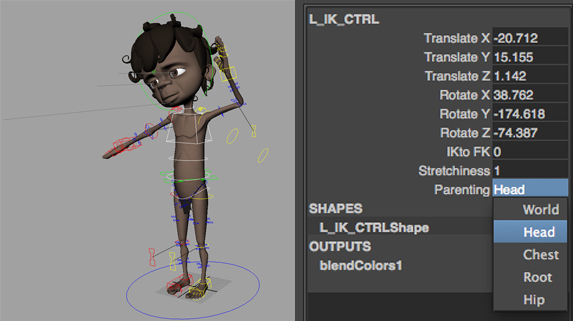 The rig contains an IK/ FK ribbon spine, IK/ FK limbs, squash and stretch limbs, cartoon style bendable limbs and a hybrid joint and blend shape facial setup.